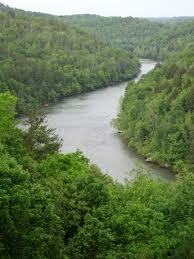 I grew up far from the ocean, but less than a mile away from the Cumberland River. Muddy, brown, its banks thick with downed trees and ragged weeds, the Cumberland had a lot of barge traffic since it was a tributary of the Ohio River. That meant catfish from the river tasted like diesel fuel. But the river had a calm, deep presence. I’m going to post some stories about fishing on the river and what it was like in those long, humid summer days with not much to do. I thought a photo might be a good place to start. Sometimes an image brings back clear memories of a time and place. Sometimes a scent can resurrect a forgotten memory. Even a sound–a mockingbird trilling a mashup of other bird’s songs, a dog barking in the far distance, just on the edge of hearing.